Indian weddings today are no longer intimate celebrations. People believe in going all out, and approach age-old traditions with a modern, contemporary outlook. However, even in the grand scale of things, weddings still focus around the bride, especially in the realm of wedding fashion.A man’s wedding ensemble doesn’t attract as many ‘oohs’ and ‘aahs’ as the bride’s lehenga.In an attempt to overcome, designers in India are taking things up a notch—menswear today is so much more than mundane suits and tuxedos. A range of exquisite apparels, shoes and accessories await the groom-to-be, for it’s his special day too! Dupattas find middle ground between regal and chic, adding that easy element to a formal outfit. 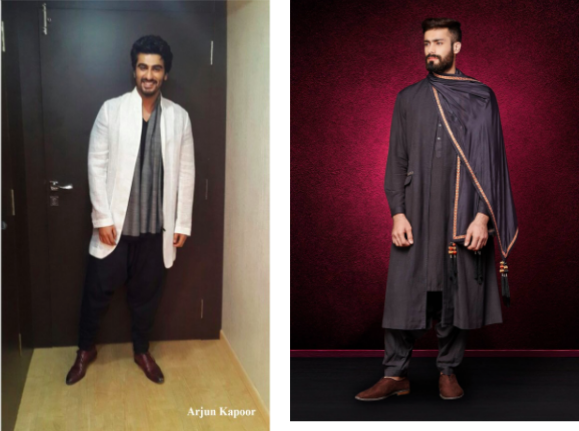 Enhancements such as ‘latkans’ or tassels are big in the Indian fashion scene right now; you can casually wrap one around your kurta, your sherwani or even that semi-indie bandhgala jacket! Nothing says suave like that dupatta draped over your left shoulder.Cotton and linen work best in summers—you can take a plain white kurta and spruce it up with a tasseled stole along with tan oxford shoes. Winters, however, call for regal undertones—deep shades like emerald or sapphire and fabrics like silk work wonders. Pair them up with bandhgala jackets and boat shoesfor a crisp and chic look. If your idea of a formal ensemble is tux and loafers, we have got news, mister! Pair up your silk dhoti or churidaar with smart oxford shoes fora quirky eclectic attire. Oxfords and brogues add a western oomph to an indie outfit. A pair of patent oxford shoes looks royal and crisp when worn with a sherwani and a safa. Pick out versatile shades like patent black,tan or coffee for that regal effect. Pocket squares are a great example of how minimalism works in magical ways. A Jodhpuri suit, a sherwani or a formal jacket in silken fabrics and deep royal shades (such as red,sapphire and emerald) complete an outfit without going over the top. 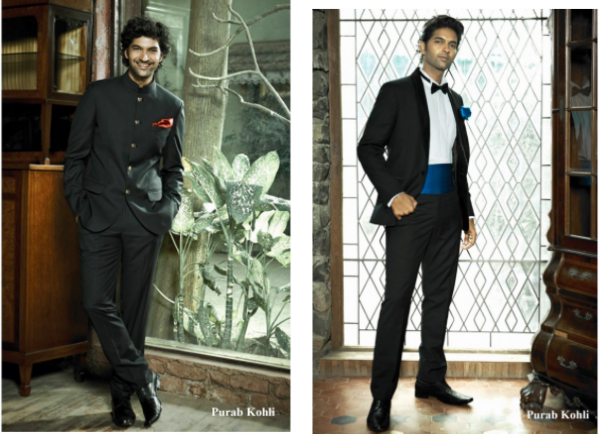 We rest our case with PurabKohli’s urbane approach to this beautifully designed Jodhpuri suit by Anita Dongre. There are various styles to fold a pocket square; you can opt for the simple presidential fold or go funky with the 3-point fold! All in all, nothing says suave like a neat pocket fold in ruby hues! What says royalty more than something designed just for you? Customization is an adored trend for those who love all things opulent, but designers like Anita Dongre take things up a notch with their keen attention to detail. After all, it’s the little things that add up to big impact! You can get men’s jacket for weddings with monogrammed buttons. Anita Dongre specializes in wedding couture for both men and women, offering an exclusive bespoke service like no other. An accessory is the essence of your outfit, whether a man or a lady; the right accessory will complete your attire. While these accessories are hot on the fashion radar right now, we also recommend safas (turbans) in vibrant shades for day weddings. Similarly, smart bow ties and cummerbund sets can do wonders for your tuxedo on a cocktail night or a reception! Embrace your special day, the royal way.